When can we observe electromagnetic force? With this electromagnetic force on current-carrying wire calculator, you can estimate the magnetic force which acts on the straight wire with current flowing through it. From a microscopic point of view, the electric current is the result of the flow of tiny charged particles - electrons. If the charged particle moves in a magnetic field, it will be subjected to the Lorentz Force. In the text below we explain how can you estimate the force acting on a straight wire with about 1012 electrons moving through it. When we place a wire which carries the electric current in the magnetic field, each of moving electrons (which comprise the current) will experience the Lorentz Force. It means that this wire will start moving if there is no other strong enough force which can stop it, for example a friction force. Such condition may be met when the wire is hanging vertically in the air. α is the angle between the direction of current and the direction of the magnetic field. We assumed for simplicity that α = 90° and therefore sin(α) = 1.You can go to advanced mode if you want to change this angle too. From this formula, you can see that if the directions of the current and magnetic field are parallel (α = 0), the resulting force is zero. On the other hand, the highest possible electromagnetic force is achievable when those directions are perpendicular (α = 90°). Did you know that the current-carrying wire produces its magnetic field? You can read more about it and determine the strength of this magnetic field with our magnetic field of straight current-carrying wire calculator. Now imagine that there are two wires with current near each other which will create their magnetic fields. What do you think will happen to them? 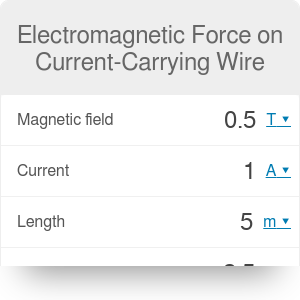 If you are curious, you can find this answer with our magnetic force between current-carrying wires calculator. Electromagnetic Force on Current-Carrying Wire can be embedded on your website to enrich the content you wrote and make it easier for your visitors to understand your message.